Adaptability is an important disposition for teachers as response to change, novelty and uncertainty is central to their daily work. Teacher adaptability is an emerging construct in research on teacher classroom behaviours with evidence of correlation to improved outcomes for both teachers and students. 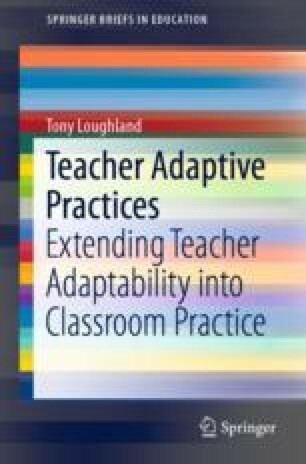 Teacher adaptive practices were conceptualised in this study as the classroom behavioural expression of teacher adaptability. The data from 278 classroom observations of 71 teachers were analysed for its relationship to the teacher self-report constructs of teacher adaptability, teacher self-efficacy and perceived autonomy support. The study found that only teacher adaptability could predict a sub-scale of adaptive practices that potentially promote student critical and creative thinking. This finding signals an important relationship between teacher adaptability and adaptive teaching given that student critical and creative thinking is a valued outcome of schooling. Curry School of Education University of Virginia. (2018). My teaching partner. Retrieved from https://curry.virginia.edu/myteachingpartner. Kane, M. T., & Staiger, D. O. (2012). Gathering feedback for teaching. Combining high-quality observations with student surveys and achievement gains. Retrieved from Seattle, WA: http://eric.ed.gov/?id=ED540960. Lucas, B., Claxton, G., & Spencer, E. (2013). Progression in student creativity in schools: First steps towards new forms of formative assessments. OECD: OECD Publishing. https://doi.org/10.1787/5k4dp59msdwk-en. Martin, A. J., Nejad, H., Colmar, S., Liem, G. A. D., & Collie, R. J. (2015). The role of adaptability in promoting control and reducing failure dynamics: A mediation model. Learning and Individual Differences, 38, 36–43. http://dx.doi.org/10.1016/j.lindif.2015.02.004. McKenzie, P., Weldon, P., Rowley, G., Murphy, M., & McMillan, J. (2014). Staff in Australian Schools 2013: Main report on the survey. Retrieved from https://docs.education.gov.au/system/files/doc/other/sias_2013_main_report.pdf. Parsons, S. A., Vaughn, M., Scales, R. Q., Gallagher, M. A., Parsons, A. W., Davis, S. G., …, Allen, M. (2017). Teachers’ instructional adaptations: A research synthesis. Review of Educational Research, 0(0), 0034654317743198. https://doi.org/10.3102/0034654317743198. Sorensen, N. (2016). Improvisation and teacher expertise: implications for the professional development of outstanding teachers. Professional Development in Education, 1–17. https://doi.org/10.1080/19415257.2015.1127854. Vaughn, M., Parsons, S. A., Burrowbridge, S. C., Weesner, J., & Taylor, L. (2016). In their own words: teachers’ reflections on adaptability. Theory Into Practice, 259–266. https://doi.org/10.1080/00405841.2016.1173993. Victoria State Government. (2018). Education state ambition: Learning for life. Melbourne: Victoria Government. Retrieved from http://www.education.vic.gov.au/Documents/about/educationstate/EducationState_LearningForLife.pdf. Willett, M., Segal, D., & Walford, W. (2014). National teaching workforce dataset data analysis report 2014. Retrieved from https://docs.education.gov.au/system/files/doc/other/ntwd_data_analysis_report.pdf.